Do you suffer with sinus and hay fever? Bowen therapy is a fast and effective treatment for the relief of these conditions.Bowen unclogs the drainage pipes of the human body and allows the sinus area of the face to clear.Sinus and Hay fever are a real problem at this time of year.Don’t put up with the pain any longer! Setter’s Health Centre Townsville has helped clients for over 23 years and offers a relaxed and professional environment for Bowen Therapy treatment and massage. We are located right in the heart of the Medical Precinct of Pimlico in Townsville and have on-site car parking with direct ground level access to our clinic. For a more information on the benefits of Bowen Therapy, contact us today about a session tailored specifically for you. 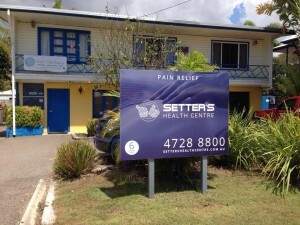 Setter’s Health Centre Townsville for the relief of pain from Arthritis.